Once upon a time it would have been bad news, perhaps even frightening news for videogame executives, but it's a measure of how far we've come that these days the following is written not in apology but in pride by a game's marketing department: "Due to its violent nature as well as some questionable enemies, Splatterhouse was the first videogame to get a parental advisory warning printed on the front of the box." Based on the arcade series of the same name (pristine versions of which are provided as unlockable bonuses in this update) the modern Splatterhouse plonks you in a mysterious mansion, drenches you in power chords and forces you to hack and slash your way through hordes of the Corrupted. These spiky, slithery and generally antisocial monsters from halfway between here and Hell obstruct your search for your kidnapped girlfriend Jennifer, who is in danger of being bloodily sacrificed by a mad scientist. Playing as questionably bearded student Rick Taylor, you begin the game in rather a poor state yourself, but fortunately you wake up just within reach of a Jason Voorhees-style mask possessed by a demon with a sick sense of humour. Once you're strapped in, it transforms you into a muscle-bound, highly resilient and brutally fast killing machine, and promises to help save your girlfriend if you will only run around the mansion slaughtering things as much as possible to sate its thirst for blood. The mask is very thirsty, but fortunately Splatterhouse is very grisly - every punch, kick, slash and scratch unleashes fountains of gore, which fill up a blood meter and a separate row of blood banks associated with your mask. It's a miracle there's any blood left for either of those receptacles, however, considering how much of it the game uses to paint the walls, floor and ceiling, not to mention Rick himself. Your basic attacks hold no surprises: multiple fast punches can be strung together, while you can charge up a heavier blow, grab and throw enemies and use a few combinations. But as you gather blood, which acts as experience, you can invest it in upgrades that allow you to extend your health, perform more powerful attacks and battering-ram charges, and whirl enemies around your head before slamming them to the ground. Should you take damage in combat, you can siphon health from surrounding enemies by expending one of your mask's blood banks. Take too much damage without doing so and you may die, or just lose a limb, which replenishes over time. While you wait you can pick up your severed arm and use it to batter people, as you can do with lead pipes, knives, chainsaws and even the occasional projectile weapon. You can also use blood banks to unleash the mask's true from, glimpsed in the introductory sequences. Blades sprout from your back and arms, you grow in stature and incoming attacks stop throwing you off-balance, allowing you to plough gorily through hordes of even the more advanced enemies and bosses. 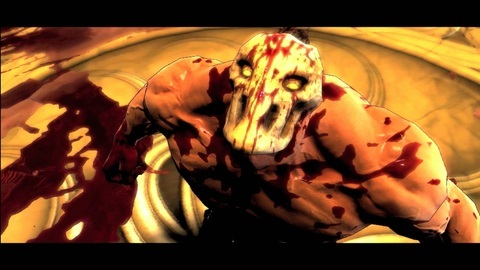 Namco fears Majin, Splatterhouse flops too. It's still in development for PS3 and 360. BottleRocket's fight for survival is over. Using members of discarded dev team.